Hitler's Table Talk: a dependable source? IS the book commonly know in the English-speaking world as the Hitler's Table Talk an English translation of François Genoud's French text? And how reliable is it? HITLER'S Table Talk comes from the original Bormann Vermerke which the late François Genoud purchased from Bormann's widow Gerda Bormann. They were actually typed from notes taken by the stenographer Heinrich Heim, whom I interviewed and who confirmed the procedure in detail. Each day's entry was initialled by Bormann at the end. They are genuine, in the first person, and highly reliable. 2. Henry Picker took over as Bormann's secretary/adjutant from Heim. He found a lot of Heim's notes in his desk and rewrote them in reported speech and published them and his own notes as Hitlers Tischgespräche. Good, but less reliable. 3. After the war, Genoud obtained by a very complex process notes on the final Bunkergespräche of Hitler. Walter Funk was involved. When I visited Geneva in about 1968 (Elke Fröhlich, the Goebbels expert, was with me) Genoud showed us a sheaf of US legal-size paper, closely typed in German. Nobody has ever seen that sheaf since. Hugh Trevor-Roper had published them in English in the late 1950s as Hitler's Last Testament. 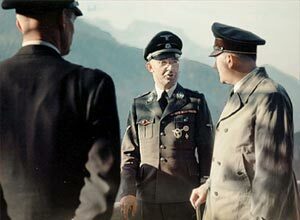 In interviews with me, Hitler's adjutants, especially Karl-Jesko von Puttkamer (on left of picture) disputed their authenticity. Eventually Genoud, meeting me in Paris, came clean and told me he had either written, or enlarged on, the originals himself, in his own handwriting -- in French. On two different occasions he said to me, apologetically, "That is surely what Hitler would have said." This explains a number of anachronisms in the text of this latter volume. It also explains why Genoud originally insisted that Hoffmann & Campe, who in the 1970s had a contract to publish the Trevor-Roper edition in German, must work from the French text(! ); I told them I had seen a German text in Genoud's hands when I visited him in Geneva. That firm then abandoned the project, and the book was published by Albrecht Knaus of Bertelsmann Verlag. 4. One day I bumped into Genoud in Paris, or we met by arrangement, I can't recall, and he gave me a complete photocopy of the Bunker conversations (1945) in German; they are heavily expanded between the lines in handwriting -- his handwriting, and I suspect his typewriter. Useless as a historical source. I donated them to the Institut für Zeitgeschichte. 5. One final detail: the English translation of the original Hitler's Table Talk was published in about 1949 by George Weidenfeld, who paid a huge sum for the rights -- half to Genoud, and half at Genoud's insistence to Paula Hitler. The Weidenfeld translation is idiomatic and excellent. I read the book as a boy, enthralled. I used the text on several occasions in my book Hitler's War: for that I was denounced as a "falsifier of history", as I preferred the idiomatic Weidenfeld translation to a wooden, turgid, and sludge-like Richard Evans translation as offered to the High Court during the Lipstadt Trial. Remember that whenever you see newspapers refer to me as having been exposed as a "falsifier" of documents.